Since 2002, We Hold These Truths has conducted over 200 vigils at “zionized” churches around the US. Evangelical Christians, who have been influenced by the religious dogma that the modern state of Israel is a fulfillment of biblical prophecy, still, desperately, need to be challenged. A group in Fresno has taken the WHTT message to Clovis Hills Community Church (CHCC) near Fresno, CA. In this 12 minute podcast, David Jacobs and his crew reveal the success of their vigil. CHCC is a Southern Baptist Convention church, but doesn’t advertise it as such. We can understand why that is, as evidenced in our reports, “Choose Life, Not War!” and “WHTT Asks Southern Baptist Convention Messengers To Choose Life Not War” that challenge Southern Baptists. 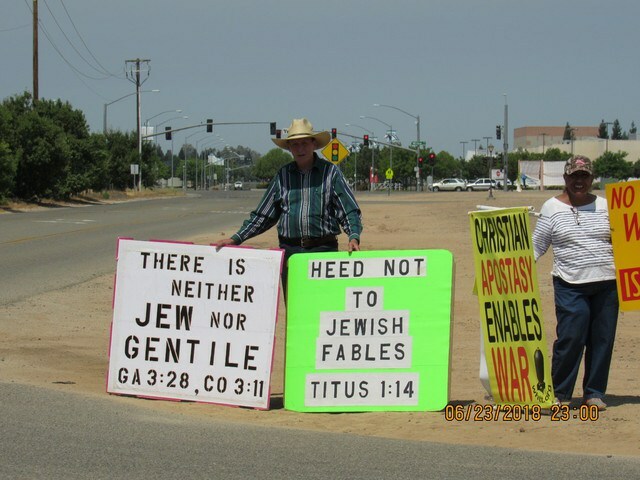 Vigil leader, Dave Jacobs, and his crew of fellow Christians greet parishioners to Clovis Hills Community Church.